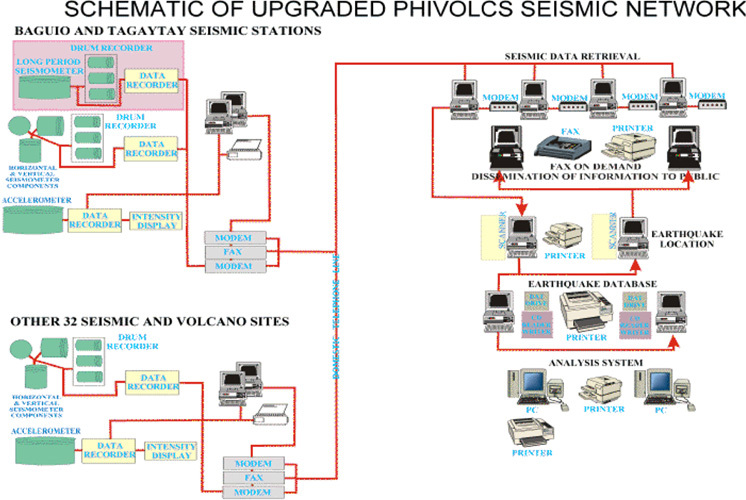 The PHIVOLCS (Philippine Institute of Volcanology and Seismology) national seismic network was significantly upgraded by the installation of digital seismic recording systems, telephone communications and a near real-time automated earthquake location and alarm generation system. Over 30 stations were upgraded from operating a single analogue drum recorder to having two digital 6-channel Kelunji D-series recorders (for redundancy), one triaxial weak motion seismometer and one triaxial strong motion accelerometer. In addition, three modern drum recorders (fed with digital data from the Kelunji seismographs) would display each component of the seismometer (east-west, north-south, and up-down). 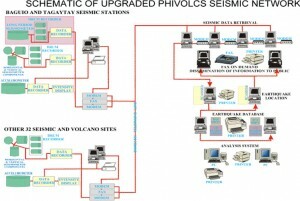 Two of the stations also had broadband seismometers installed for global earthquake monitoring. 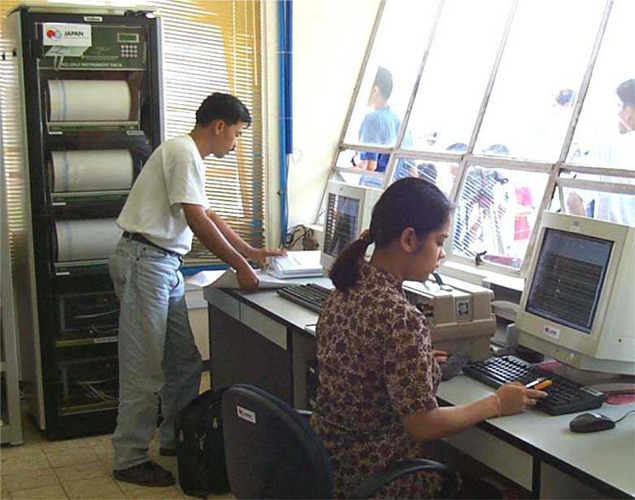 What is now known as eqServer began as a suite of software that operated at each field station and at PHIVOLCS head office. The remote stations performed automatic P arrival picking and sent this information via FTP to the head office using a direct dial-in telephone system. There, all arrivals are automatically placed in a database and event association performed. An initial location and magnitude are computed automatically. Locations could be improved at a later time with additional data received via radio or other means using eqWave and eqFocus. Earthquake information could be transmitted to interested parties via web page bulletins, email or pager. Funded by JICA (Japan International Cooperation Agency), the automated system provides assistance in responding to the significant hazard caused by earthquakes, volcanoes and tsunami in the Philippines.